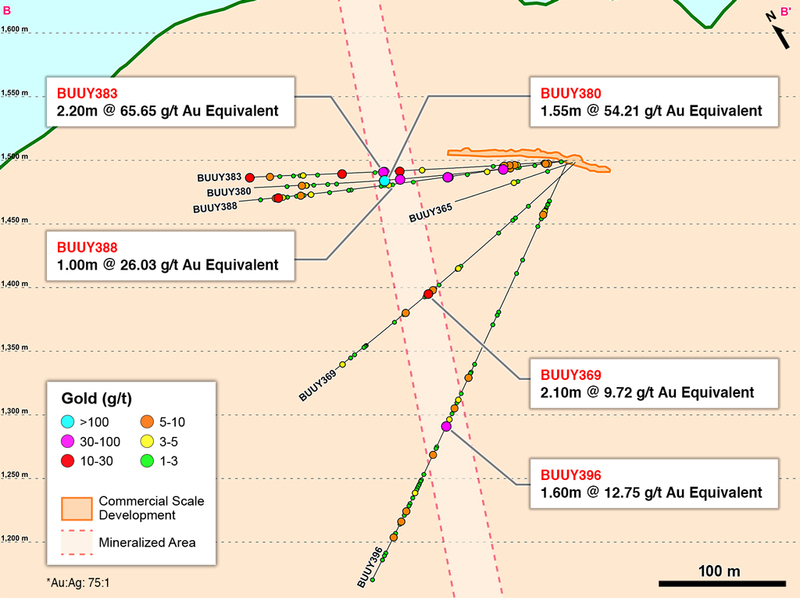 24.40 metres @ 10.66 g/t gold Equivalent (BUUY401D03). BMZ1’s total vertical extent now totals more than 400 metres and it remains open at depth for expansion. 15.50 metres @ 20.47 g/t gold equivalent (DYR0086). 0.50 metres @ 57.46 g/t gold equivalent (BUUY401D01). 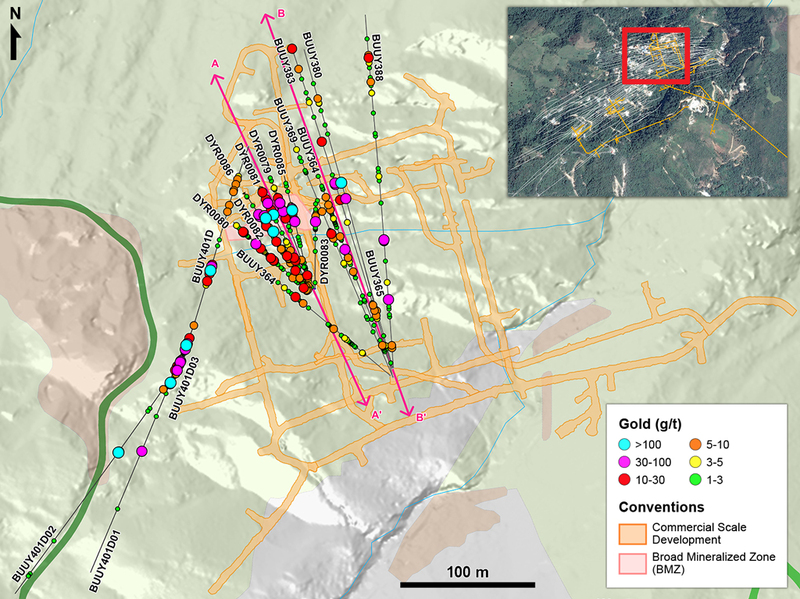 These results, coupled with earlier results announced in 2018, confirm that much higher grades of gold and silver versus the current mineral resource model are present in this vein family at these elevations along more than 300 metres of strike extent (and open). 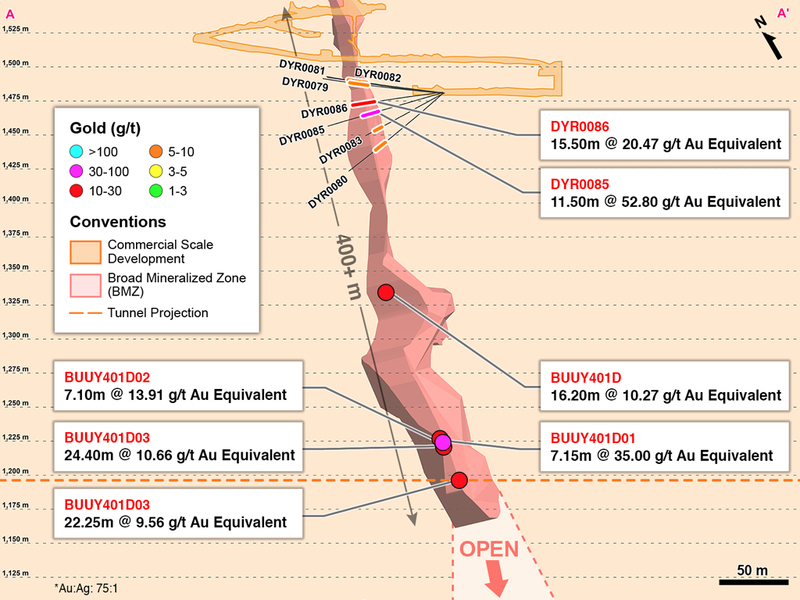 Continental Gold Inc. [TSX:CNL; OTCQX:CGOOF] is pleased to announce additional high-grade assay results from seven definition holes and 11 expansion and infill holes drilled into the Yaraguá system as part of its 2018 definition and exploration drilling program at its 100%-owned Buriticá project in Antioquia, Colombia. The Company presently has 11 diamond drill rigs in operation; four rigs are being utilized for the ongoing stope definition drilling program and the other seven rigs are conducting infill and mineral resource expansion drilling at the Yaraguá and Veta Sur deposits. Definition holes DYR0079-DYR0086 were drilled to the north-northwest from a chamber located along the main access ramp in the central portion of the Yaraguá system located slightly east of BMZ1. Results to date are being used to verify and finalize stope designs and schedule production from this area, anticipated in 2020. Definition drilling into BMZ1 is anticipated to continue throughout 2019 as development advances vertically and new chambers are constructed. The broad mineralized zone (“BMZ”) consists of a group of modelled precious metal-bearing veins in the current mineral resource estimate block model with mineralization occurring between these veins, generally in the form of veinlets at oblique angles to strike. The majority of the mineralization between modelled veins is not in the current mineral resource estimate, providing potential upside both in terms of identifying significantly broader and more productive zones for mining and increased mineral resources. To date, the Company has identified up to seven BMZ targets for testing and will systematically drill each target zone as underground mine development advances. BMZ1 encompasses a matrix of the east-west trending FW, San Antonio and HW veins as well as a package of a NW‑SE vein and subsidiary veinlets. For information on the Buriticá project, please refer to the technical report, prepared in accordance with NI 43 101, entitled “Buriticá Project NI 43–101 Technical Report Feasibility Study, Antioquia, Colombia” and dated March 29, 2016 with an effective date of February 24, 2016, led by independent consultants JDS Energy & Mining Inc. The technical report is available on SEDAR at www.sedar.com, on the OTCQX at www.otcmarkets.com and on the Company website at www.continentalgold.com.